Realschule (German: [ʁeˈaːlʃuːlə]) is a type of secondary school in Germany, Switzerland and Liechtenstein. It has also existed in Croatia (realna gimnazija), Austrian Empire, German Empire, Denmark and Norway (realskole), Sweden (realskola), Hungary (reáliskola), Slovenia (realka) and in the Russian Empire (реальное училище). 1.6 The "Erweiterte Realschule" and "Realschule Plus"
For Johann Joachim Becher, education also had a mandate to support the replacement of the Holy Roman Empire with a more republican commonwealth. His school would have had the task of creating education and teaching an organized state structure. His ideal was the artisan, the educated scholar, the universal scientist. In the German secondary school system, Realschule is ranked between Hauptschule (lowest) and Gymnasium (highest). After completing the Realschule, good students are allowed to attend a professional Gymnasium or a general-education Gymnasium. They can also attend a Berufsschule or do an apprenticeship. In most states of Germany, students start the Realschule at the age of ten or eleven and typically finish school at the age of 16–17. In some states, Realschulen have recently been replaced by Oberschulen or Sekundarschulen. In 2006 1.32 million German students attended a Realschule. At Realschule, a student gets an extended education and learns at least one foreign language, usually English. In the state of Baden-Württemberg, after the sixth grade, the student has to choose among technology, home economics, and a second foreign language, usually French. The new subject becomes the student's fifth main subject, after German, maths, science and English; and it is also possible to learn other foreign languages in free workshops. Other subjects are geography, social sciences, economics, history, religious education, and physical education. After the 8th grade a student has to choose between arts and music. High school diplomas obtained in Canada or the United States are usually acknowledged as a Mittlere Reife (graduation from a Realschule). In some cases however students may apply for certain subjects at a university. All students holding an American high school diploma may apply for the Studienkolleg, and after successfully graduating from this they may attend a German university. Those holding a high school diploma can choose from a wider range of possible major subjects at a German university if they did well on the SAT or ACT. Those who scored higher than 1300 on the SAT or higher than 28 on the ACT may apply for any subject at a German university. Gymnasia and Realgymnasia are the classical higher or secondary schools of Germany. Starting in 2010/2011, Realschulen were formally abolished in Berlin and merged with Hauptschulen and the old Gesamtschulen to form a new type of comprehensive school, called Stadtteilschule in Hamburg and Sekundarschule in Berlin. According to the PISA examination the students attending a Realschule were outperformed by those attending a Gymnasium. However, they did better than those attending a Hauptschule or a Gesamtschule school. PISA 2003 – Der Bildungsstand der Jugendlichen in Deutschland – Ergebnisse des 2. internationalen Vergleiches (PISA 2003 – Education level of young people in Germany - results of the second international comparison). The German tripartite system of education has been widely criticized for separating children along class lines at a very early age. For instance, in some German states, a decision is made in the sixth or even the fourth grade about whether a child is to continue in the Gymnasium, the Realschule, or the Hauptschule. Only the Gymnasium is a university-preparatory school, so critics argue essentially a decision is made as early as the fourth grade about whether a child will be allowed to attend college. The system is considered so onerous outside Germany that the OECD even sent a special envoy to Germany to condemn current German practice. Specifically, the Brazilian expert found that German schools basically separate children according to social class, with children of academics and professionals more often being sent on to a Gymnasium, and working-class children being sent to a Realschule or a Hauptschule. According to critics, the system is widely considered within Germany to be socially useful in the sense that the upper class is able to reserve the best schools for itself without having to resort to private schools. Finally, no democratic society outside the German-speaking world has tripartite school systems that separate children largely according to background; indeed, this finding was the main complaint about Germany in the recent PISA study. Proponents of the tripartite system consider the arguments brought forward by the critics to be invalid. They point to the fact that not only Gymnasium, but also comprehensive schools and schools serving mature students such as the Kolleg or the Berufsoberschule offer the possibility for the Abitur. Also it is possible to attend college without holding the Abitur. They also hold the opinion that state-funded Realschulen and Gymnasiums offered many working-class children the possibility to move up the social ladder. Also, proponents of the tripartite system fear the abolishing Gymnasia and Realschulen will lead to the growth of a private school sector. Proponents of the Realschule also hold the opinion that it aids students' personality development. According to a study those attending a Realschule became more altruistic and more likely to care for others over time. The "Erweiterte Realschule" and "Realschule Plus"
The "Erweiterte Realschule" (expanded Realschule) is a school that exists in the German State of the Saarland. It is not to be confused with the Realschule. While the Realschule is a selective school, the Erweiterte Realschule is a school that does not select its students on the basis of academic achievement or aptitude. It streams students by perceived ability after 7th grade. The "Realschule Plus" is a non-selective school that exists in the State of Rhineland-Palatinate. It offers general education classes (that resemble normal Realschule classes) as well as remedial classes. 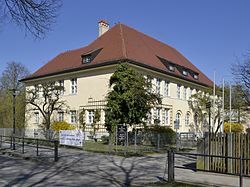 The Erweiterte Realschule and the Realschule Plus are not the school of first choice for many students and often are attended by students who have been turned down by or have been expelled from other schools. The realskole existed in Norway between 1935 and 1970. It replaced the former middelskole, and was the level between folkeskole (primary school) and gymnasium. The majority historically left school after folkeskole, and the realskole was meant as preparation for the gymnasium, itself a preparation for university studies. Only a small minority attended gymnasium in those times. ^ Ehmke; et al. (2004). "PISA 2003 – Der Bildungsstand der Jugendlichen in Deutschland – Ergebnisse des 2. internationalen Vergleiches" [PISA 2003 – Education level of young people in Germany - results of the second international comparison]. PISA-Konsortium Deutschland (Hrsg.) (in German). Münster/New York: Waxmann. p. 244. ^ "CESifo Group Munich - Home". Cesifo-group.de. Retrieved 2013-07-22. ^ "German school system reflects nineteenth century". Justlanded.com. 2007-06-19. Retrieved 2013-07-22. ^ "Chancengleichheit im dreigliedrigen Schulsystem? : Soziale Benachteiligung auf Grund schulischer Selektion am Beispiel Hauptschule: Amazon.de: Luisa Liebold: Bücher". Amazon.de. Retrieved 2013-07-22. ^ "Elternverein Nordrhein-Westfalen e. V. - Gesamtschule ungeschminkt - Alarm!". Elternverein-nrw.de. Retrieved 2013-07-22.